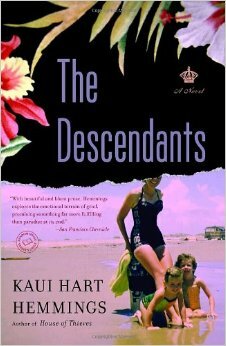 In The Descendants post of the day, a peek at Kaui Hart Hemmings, the author of The Descendants, being interviewed about her novel having been adapted for the screen. Cute! I finished the book in one sitting and now I can't wait to buy Hemmings' book of short stories! I love the honesty that radiates from this book. I love the fact that Joanie, the wife and mother in a coma, isn't portrayed as a one-dimentional "angel" snatched too soon from her family, but as a real, quite seriously flawed woman who is nonetheless deeply loved by her husband and daughters. Every character came across as somewhat odd, certainly flawed, and yet very human and in some way likable. Joanie's unreasonable father, who defends his dementia-stricken wife one minute and shouts impatiently at her the next is perceived by the reader as sympathetic and annoying at the same time, and Sid goes from providing one-dimentional comic relief at his introduction, to proving himself to be an integral character of many complex layers by the end. I loved this book, and am eagerly anticipating reading Kaui Hart Hemmings' next effort...whatever it may be. Yes! I think the flawed 'character' of the characters, especially Joanie, is a huge part of what made this book so special. Hemmings is definitely a writer I want to read more of as well. What did you think of the film?